This painting was started a few days before Christmas in 2005, on a Kona Coffee farm in Hawaii, just outside the village of ‘Captain Cook’. There are so many stories around this painting, and when finished and framed it travelled the world, spending time in a Santa Fe Gallery before returning home to me where it hangs above my bed. Roger’s coffee farm & B&B was quite a place, and sadly no longer a place to stay. Roger was a retired neuro physisist who had worked on researching the brain. He’d become disillusioned after his team had figured out a cure for Parkinson’s and were basically told they would not be funded to publish it. He then left California and bought the Coffee & Macadamia farm with his wife and ran the B&B. He had a system of ‘selecting’ guests by the way email or phone requests were sent. This meant that during my 7 night stay there were scientists, nutritionists, teachers, Canadian loggers, and a very interesting Vietnamese banker, her son and mother. I even had to spend one night on the sofa as he’d double booked my room! 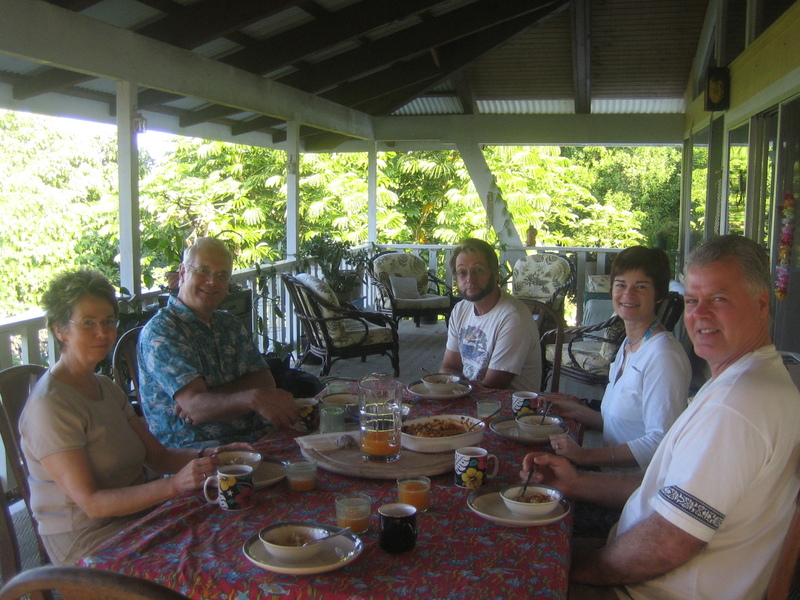 Breakfasts were a long winded social affair, all sat together on the wooden balcony eating papaya , mangoes and Avocados ( you could hear the last two fruits thud as they fell off the trees during the night). This particular morning was December 23rd and it was started by a beautiful pink sunrise and at breakfast we were joined by new guests, Dwight & Jane from Vancouver island, who will feature in another story. 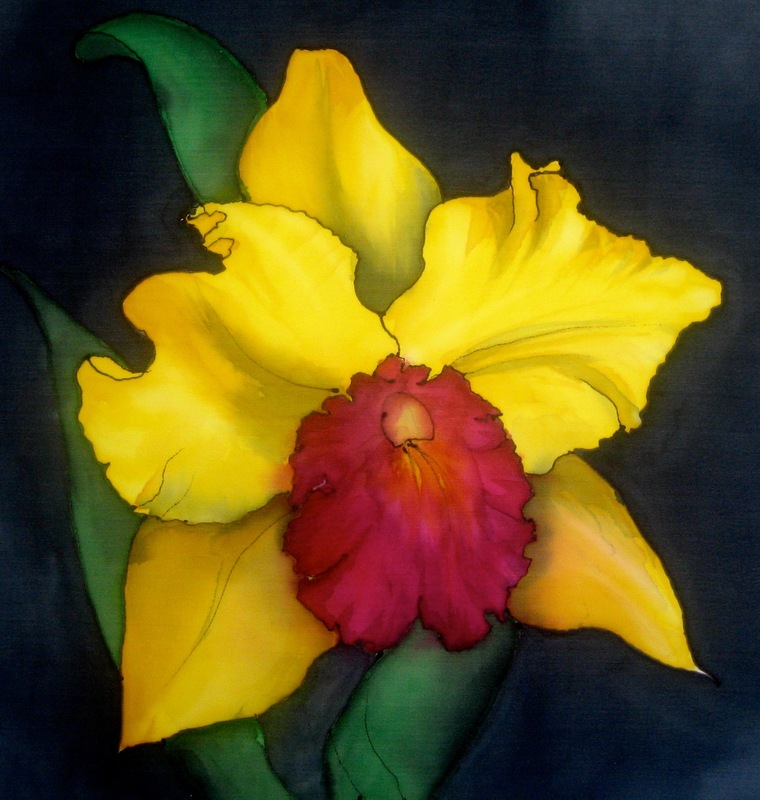 I’d spent much of my time driving off for the day exploring the island, this particular morning I’d decided to hang around and paint the orchid growing in one of the flower beds. Later in the day I was travelling to Kona where I was expecting to watch a Hula demonstration. Hula had so far eluded me, dances & demos being cancelled when ever I arrived! The Vietnamese grandmother, who spoke no English, liked to be kept busy and so had picked most of the Macadamia nuts off the trees at Roger’s farm. Roger had insisted that it wasn’t necessary, however on she went. After all the other guests had left for the day & I was sat quietly painting, a car arrived with at least three adults in the front and twelve children in the back. Difficult to count accurately as they kept moving! Roger chatted to them and then they were all rounded up back into the car and off they went. They were apparently from the Marshall islands and had come to pick the macadamia nuts. The fifteen dollars or so, they would have been paid, would have fed the lot of them over Christmas, but there were no nuts left to pick. This simple chain of events has often come to my mind and since then I’ve since had occasion to think hard before I offer ‘free’ help. Roger had asked if I wanted to go up the mountain later to watch the sunset as it was a clear sky. I thought he just meant a walk up the mountains on that ridge, and as I really wanted to see the Hula I declined the offer. It was my last full day without travel before flying home from Honolulu on Christmas Day, and I really did enjoy my own company. Roger and his wife had a dog, Koa . Unfortunately, that morning Koa had accidentally eaten Rat poison and so Roger had to take him to the vets. I agreed to call him after the Hula class and then if he was still able we could go up the mountain together. I had around an hour sat in the peaceful garden shaded by a beautiful Angel’s trumpet tree and worked on my painting. When the time came I set off to watch my Hula in town. I arrived at the studio where every Friday lunch time a hula group practiced and I was very excited to at last have an opportunity to sketch and photograph some dancers so I could produce a series of paintings later. I’d phoned the previous day to check they were still meeting, despite it being Christmas week, and they were, that is, they were until my car pulled up and I saw a freshly pinned up notice saying that due to unexpected circumstances that day’s session was cancelled. I was VERY disappointed and so returned to my car and just sat trying to think ‘why can I just not see Hula?’ And what else could I do that day. I was only sat for a few moments when a huge 4×4 truck pulled up next to me. It was Roger, with their dog, he had the dog wrapped up in blankets and he’d been given some drugs from the vet next door to the Hula class. Koa had been sick and so they were confident that most of the poison had come up. Roger then had a sleepy dog to look after and when he discovered my plans had been scuppered too he suggested we all went up the mountain right then. This had been an original plan of mine having always been fascinated by mountains and observatories but I’d reconciled not making it this trip as you had to hire a 4×4 and needed warm winter clothing as it’s 4205 metres above sea level. I was SO pleased and very excited. Roger had a great collection of warm clothing in his truck from taking other guests on Volcano & mountain trips. Off we set. The drive to Mauna Kea is a long one, the road sweeping through large plains. ( apparently the largest ranch in the USA is on Big Island, Hawaii) as we climbed the mountain other traffic became scarcer and the air thinner. We had some great conversations too. I have become quite open minded and intrigued by the more ‘spiritual’ sides of life. However I am also very interested in science and in particular physics. Roger was the other way around, a pure scientist who found himself living on a very spiritual island. 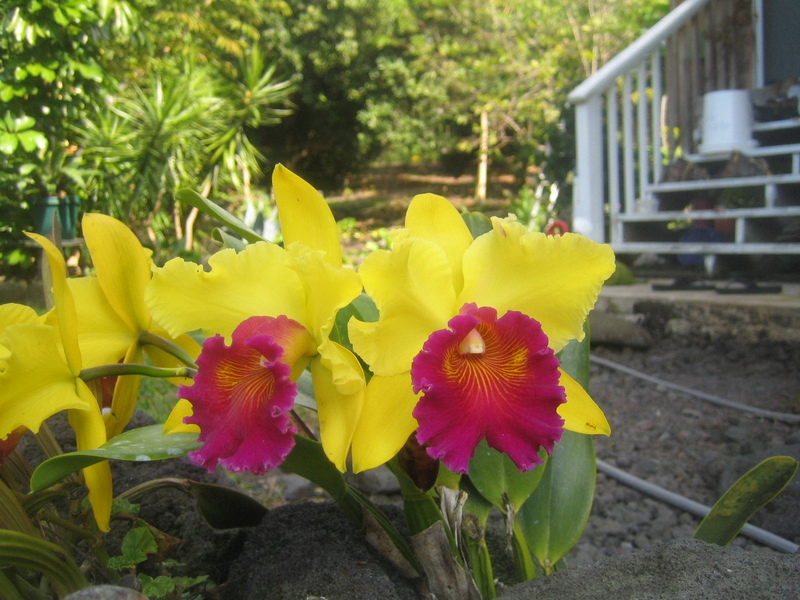 His B&B was often used by delegates of conferences being held around Kona. Roger had enjoyed having weird and wonderful guests staying whom he could question with the aim of proving them mad and science winning the day. One guest he’d had though had really made him question his beliefs. A very well known ‘Dolphin singer’ was his guest. So important that Roger’s rooms were taken up by this chap and his body guards and entourage. This of course intrigued Roger, so much so that he attended the talk. This chaps talent was in communicating with Dolphins and Whales by playing music to them, he’d also worked out that Dolphins from North and Southern hemispheres communicated in different keys, F major and F minor. This was something that had baffled scientists for years. Roger so enjoyed the talk that he and the Whale man sat up all night talking, and for the first time Roger’s eyes were opening to a new way of thinking. As the sun arose his guest retired to bed. Thirty six hours later his guest still hadn’t woken up. His main bodyguard had said this was common and could be a Shamanistic experience so it was best to leave him, after a talk or presentation he would often sleep for 24 hours. This was becoming his longest sleep and people were getting worried. Roger was aware that if he was taken to a hospital on Big Island he’d be pumped full of drugs, with Rogers experience with drugs he knew that could be dangerous. He convinced and arranged that his guest should be taken to Honolulu hospital which had a more holistic department that could care for the Whale singer in a safe environment. Roger never heard about him again, other than he had woken up after quite a period, but had then lost his memory. This really troubled Roger. He’d finally met someone whose wisdom and experience had filled the missing links for Roger. But now he was lost, possibly for ever, and was this man mad or a genius? We discussed how the universe worked, why we were all here and that maybe once we’d learned this life’s lessons our work is done and then we pass on. Maybe the Dolphin man had passed on his knowledge and then ‘had to stop’. I’d love to know what happened to him. 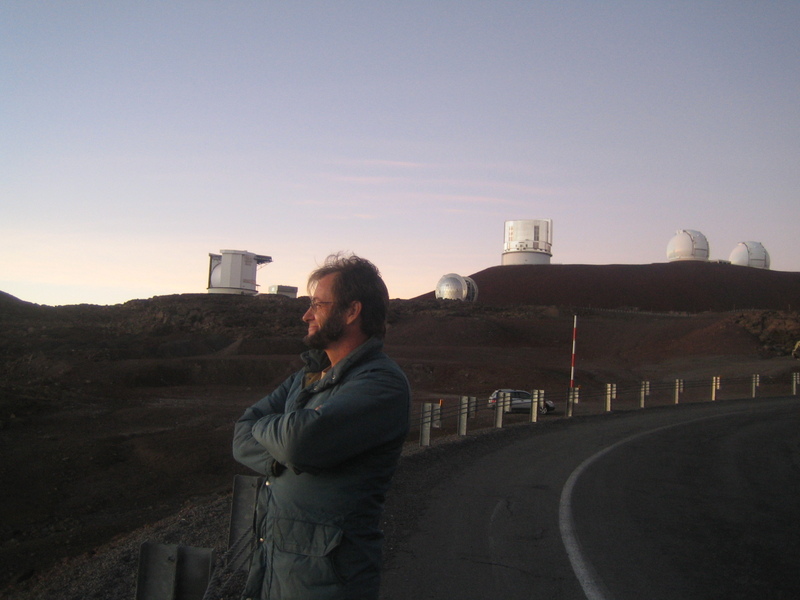 Roger and I stopped at the look out, near to the summit of Mauna Kea. The car park was full of astronomers and telescopes. The shop was showing informative films about planets and space. I bought astronaut food for my boys. 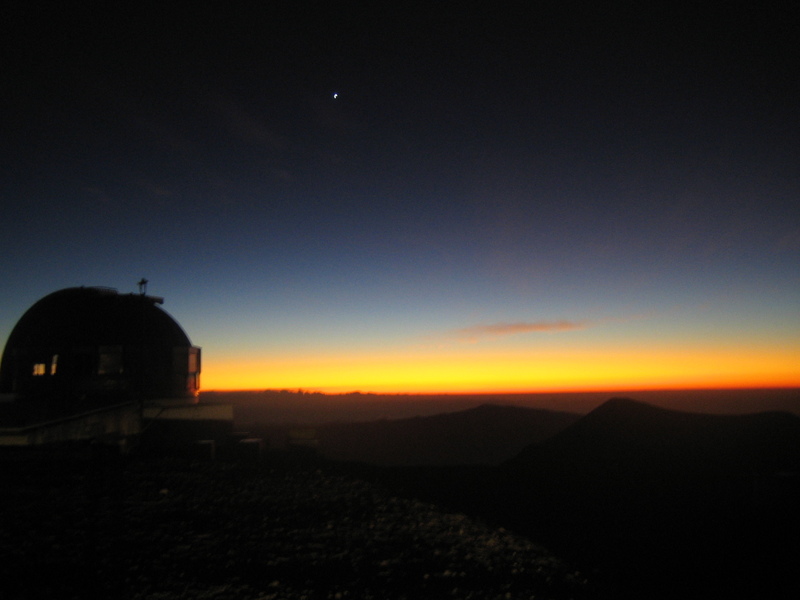 You are requested to stop here for at least half an hour to allow your body to acclimatise to the high altitude. Eager to get to the summit, we set off. 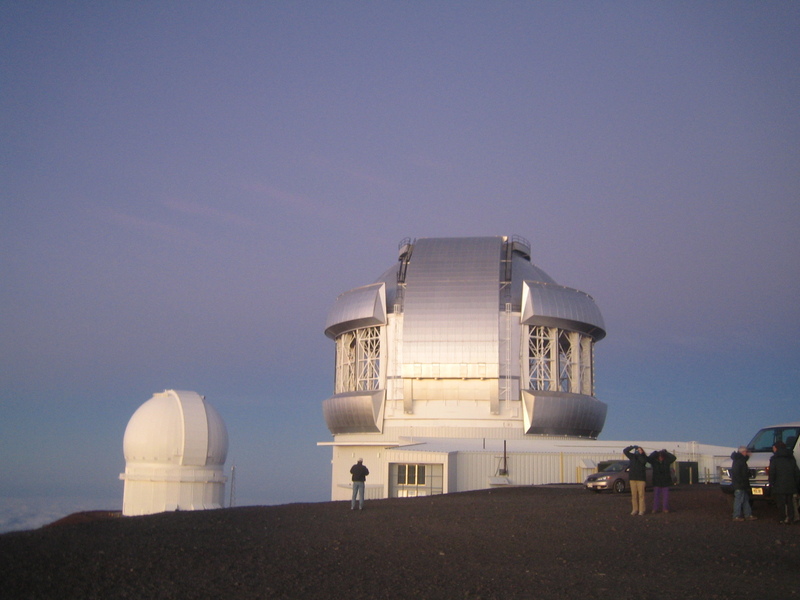 At the top are observatories and a car park. The views are spectacular looking over the Big Island, then onwards to Maui , Kahoolawe, Molokai and Lanai. Behind us was the actual summit. A reddish brown pile of rubble with a small hand built ‘shrine’on top. I had to climb that summit, although it was a mere 50 metres above us, at over 4000metres above sea level every step took immense effort. Roger surprised me by saying he had to climb it without his boots. He left them in the truck and set off bare footed scrabbling over the rubble. After great effort from both of us we arrived at the summit as the sun was setting. There was a layer of cloud beneath us covering Kona but a rainbow of colours was meeting the cloud followed by a dark hood of night. Roger was surprised by something when we reached the top. He said he had the answer to his question.There was a fragile looking Hawaian frame with various shells and piles of stones within it. Roger had been expecting to find something but it wasn’t there. When darkness falls the sky above becomes sprayed with stars. I had never seen anything like it, not even in Africa. There was a group of around twenty of us in awe of the beauty and delaying being ushered back down. The rangers don’t allow anyone to stay all night. There was one lovely ranger we chatted to, whose name meant ‘Fire’. When you drive back down you cannot use headlights on the trucks, just hazard lights. That makes for quite a scary drive as the dirt track, accessible only with 4×4 vehicles, spirals around the mountain, back to the visitors centre. As we returned Roger explained the bare foot climb and summit disappointment. 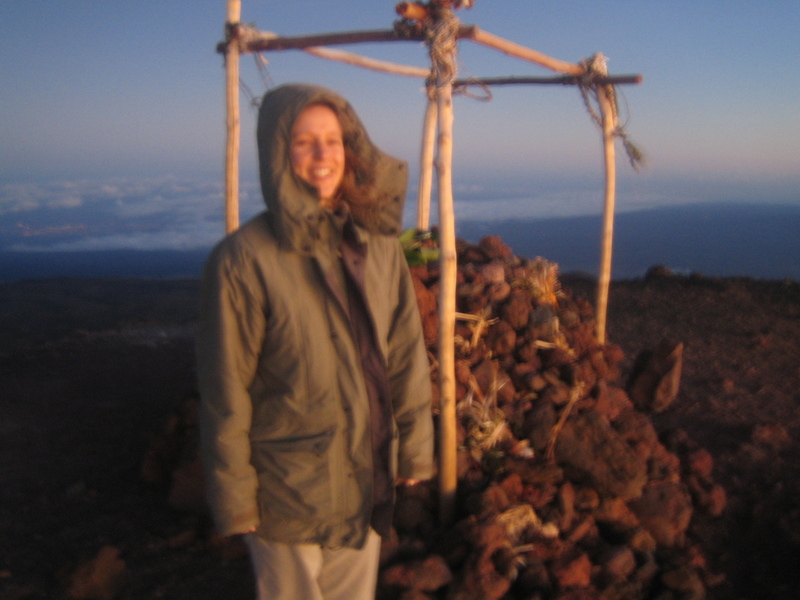 On his last visit ( under a new spiritual awareness since the Dolphin singer ) he had felt a strong urge to remove his favourite walking boots at the summit and place then on the shrine. Thinking the exercise was to test his faith in human nature, he expected to find them still there when we visited. They weren’t. That answered his earlier question. Roger was angry and disillusioned. To me it was obvious, he’d been asked to leave them as someone would have a greater need than Roger for those boots. This hadn’t occurred to Roger and we laughed about what could have happened for someone to find themselves bootless on a mountain summit. Wouldn’t it be wonderful if that question could be answered from someone reading this! The following day I left Rogers coffee farm, after tasting the coffee,( I hadn’t drunk coffee for over 15years) and had one last day in Waikiki before flying home on Christmas Day. Christmas Eve was spent shopping with my new Vietnamese friend,who lived in Oahu and had returned from her stay at Roger’s a few days before. There are numerous other tales to tell from this amazing Hawaiian adventure, and I hope to recount them all over the coming months. This active life of mine, pre illness, almost seems like a dream, but what joy it has given me to recollect all these wonderful memories. 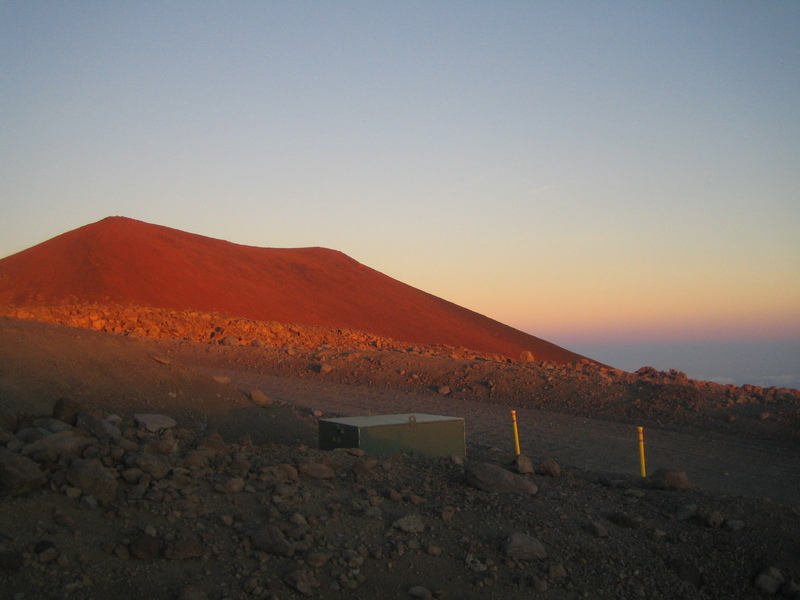 Even if I never climb a mountain again, I am so very blessed to have ever climbed Mauna Kea, and those of you who are still able, please climb as many mountains as you can, even if it’s just for me, you won’t regret it!